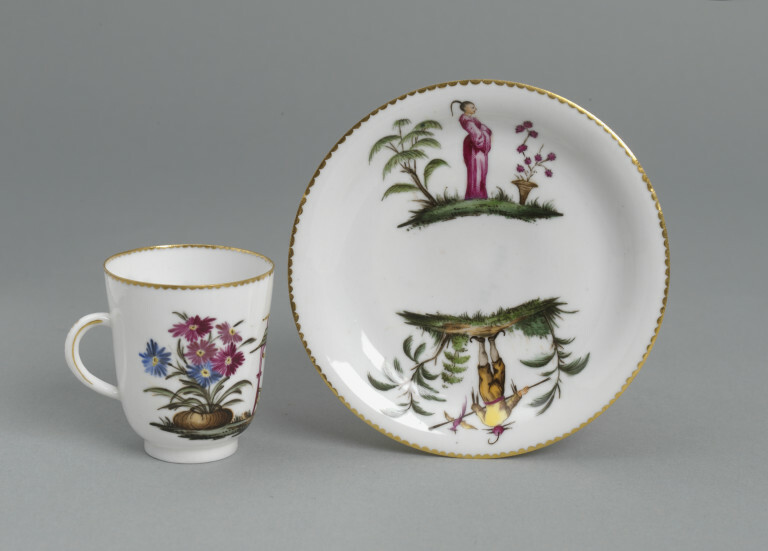 Cup and saucer of hard-paste 'egg-shell' porcelain painted with enamels and gilded. Cup and saucer of hard-paste porcelain, Doccia porcelain factory, Doccia,ca. 1862. In 1861theGinori factory received an award for their egg-shell porcelain displayed at the National Exhibition in Florence (GINORILISCI 1963, p. 116, 146 and ESPOSIZIONE ITALIANA 1861, p. 287) and in 1862, among the objects that were sent to the London Exhibition, they listed cups described as “exquisitely thin with blue flowers in relief decorated with gold” and “Chinese figures” (AMD, arm. 1, palch. 3, cart. 153, Nota degli oggetti spediti dalla Manifattura Ginori di Doccia […] Londra) which correspond to the types shown here. Since they do not appear in the lists of objects sent to the 1854 Exhibition in Florence, nor in those sent to Paris in 1855 and 1867, it is likely that these cups were made around 1862. Similar objects with the same mark are in the Museo di Doccia (inv. 1224- 1225, 1227-1228, 1231-1232, 1249-1252) as well as a tête-à-tête coffee set with gold decorations in relief (inv. 1253-1260, CEFARIELLO GROSSO 1988, p. 90, fig. 100). Four cups of the same type with chinoiserie decorations are also published in MORAZZONI, LÉVI 1960, plate 230. Egg-shell porcelain was a novelty then in fashion at various European manufacturers (FAŸ-HALLÉ, MUNDT 1983, p. 169, 179). It was made by casting in plaster moulds, a technique that at the time was usually used only for display objects, like the porcelain tablets used for reproductions of famous paintings (MESLIN-PERRIER, SEGONDSPERRIER 2002, p. 179). The figures and the other elements of the Chinoiserie decorations are based on the coloured engravings in a miscellaneous album of prints which is in the library of the Museo di Doccia (inv. 203). In the same album there are engravings by Jean Baptiste Pillement and others taken from various collections including The Ladies amusement; or, Whole art of japanning made easy…drawn by Pillement and other masters, published in London by Robert Sayer in three editions between 1760 and 1775. The cup (cat. 71) is of particular interest because it is signed “Giusti”, to the right of the figure of the fisherman at the edge of the lawn. 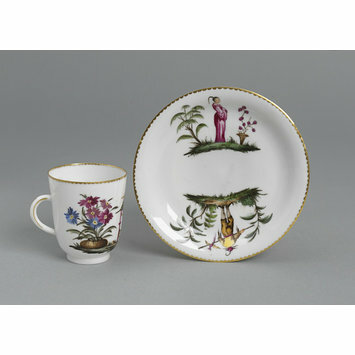 In the 18th and 19th centuries Ginori porcelains were very rarely signed by the artist who had decorated them. In this case the artist might be Enrico Giusti, son of Francesco Giusti (see cat. 122) who, in1855, the year his father died, was attending the Fine Arts Academy in Florence using a scholar ship from the Ginori factory and, in 1858 at the age of 21, appears in documents for the first time as an apprentice porcelain painter (AMD, arm. 1, palch. 1, cart. 21, ins. 1Ordini e disposizioni dal 1853 al 1855, doc. 1105 and ins. 4Disposizioni e proposizioni […] 1854-1858, doc. 943). His name is later mentioned in documents up until 1896 (AMD, arm 3, palch. 2, Ruolo del personale 1883-1896) as a painter of artistic porcelain who was paid “a fattura” or by the piece.